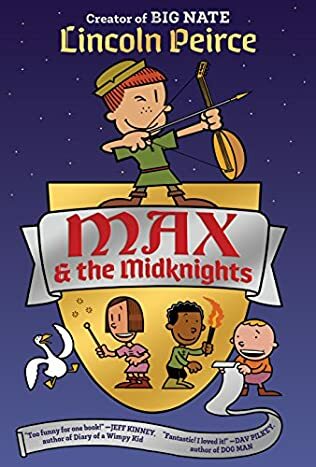 Before I even opened and started to read Max and the Midknights by Lincoln Peirce, I had readers in mind to recommend it to. The author's Big Nate series is well-loved by many students at my school. Illustrated novels are also a big hit with readers, especially with those who are more reluctant to read. Max and the Midknights is a middle grade novel that is illustrated with comic strip-like panels. Although not a true comic or graphic novel, those readers who enjoy such a format will be attracted to this book. This book will appeal to kids because of the author and the format, but it's also highly entertaining. Max wants to be a knight, but for various reasons, including the fact that she is a girl, this seems like a dream that will never come true. But, when her uncle is kidnapped by the evil king and she embarks on a quest to save him, she has an opportunity to prove her skills as a knight. It's not only her uncle who needs saving, but the entire town of Byjovia. There is lots of action, adventure, and humor. The setting, which is the middle ages, will also capture readers' imagination. I predict this book will be one that becomes as popular as the Big Nate series and other illustrated and graphic novels. #BookExcursion, with an advance reading copy. The book publishes in January.